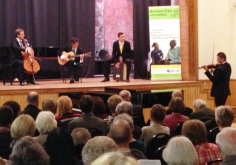 Pupils from The Purcell School gave a concert to a packed house on Wednesday 27th February, at a concert in aid of The Watford Peace Hospice. Guests at this third annual Peace Classics Concert helped raise more than £4,000 for the Hospice. Mayor of Watford Dorothy Thornhill and mayor of Hertsmere councillor Pat Struck were among the audience of 200. Music ranged from Chopin and Bach to an up tempo jazz set and some student-written pieces. The evening was sponsored by the Blue Check restaurant which provided wine and fruit juice for the pre-concert reception and during the interval which included hot food prepared and served by catering students from West Herts College.